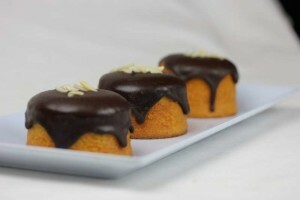 Are you stuck on what delicious Mother’s day treats you should be including at your celebrations? 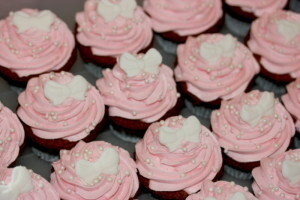 Why not check out the huge variety we have at Exquisite Cakes that are perfect treat additions! To begin, we have a large range of Mother’s day inspired cookie pops! Our cookies are available in three delicious flavours, these include; gingerbread, chocolate bread and vanilla bread. 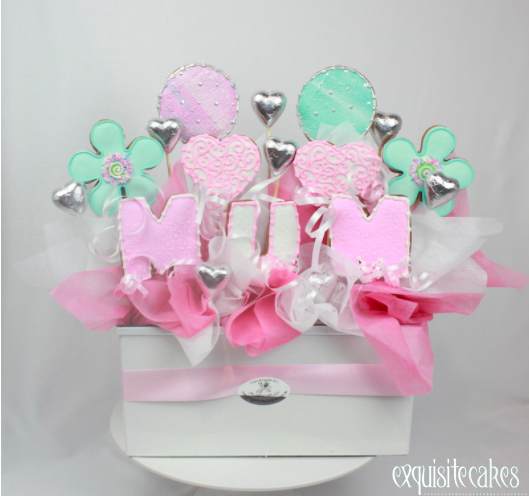 Our range varies from individual cookie pops to beautiful mother’s day inspired cookie bouquets. These designs can include flowers, love hearts, butterflies and even individual letters. This enables you to customise a bouquet suited to your mum. This year, we have decided to create something a little more special. You now have the opportunity to create a fully customised cookie bouquet! This special bouquet will include cookies with personalised messages of your choice i.e “i love you because..”. This enables you to create a special gift that is personalised just for your mum. Cupcakes – Our cupcakes vary in designs, these include basic frosting with sprinkles to moulded or piped flowers. Macaroons – Our macaroon flavours include; chocolate, vanilla, halzenut, salted caramel, pistachio, passionfruit, strawberry, red skin and snickers. 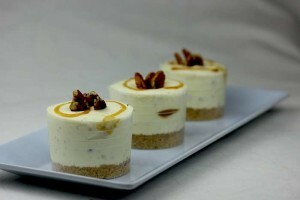 Cheesecakes – Our cheese cake flavours include; berry, mango, lime and coconut, new york, raspberry and white chocolate and caramel pecan. Individual cakes – This range includes; apple berry crumble, black forrest cake, tiramisu, rocher dome, chocolate oreo brownie and caramel slice. Gluten free cakes – Our gluten free range includes; berry friand, pear friand, apple and cinnamon friand, jaffa cake and halzenut blueberry crumble. Tarts – Our tart range includes; lemon, salted caramel, vanilla brulee, mini choc vanilla, mini caramel macadamia and lemon meringue pie. So why not visit our website or call our store on 8850 1340 to discuss the dessert choices suited to your Mother’s Day celebrations this year.